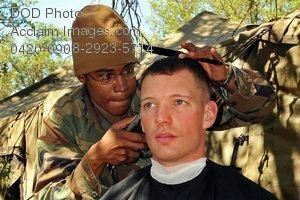 Description: Free, public domain image: Soldier Giving Another Soldier a Haircut. FORT HUNTER LIGGETT, Calif. (April 20, 2009) Ships Serviceman 3rd Class Cedric Obryant, assigned to Naval Mobile Construction Battalion (NMCB) 3, gives a haircut ot Lt. Aaron Ripple during Operation Bearing Duel 2009. Bearing Duel is an annual field training exercise that tests the battalionÕs ability to deploy to a contingency environment. (U.S. Navy photo by Mass Communication Specialist Seaman Ernesto Hernandez Fonte.